One of the features of ACAManager is the ability to automate the process for submitting notices to employees, therefore easing administrative burdens. In this user guide, learn how to review notices, send them in electronic or print form, and view notices after submission.The Department of Labor created documents for employees who are benefit eligible as well as those who are not. Both documents are in the ACAManager system and, based on the hours loaded in to the system, are generated at the conclusion of both the new hire and current/ongoing employee measurement periods. The documentation prepared for the employee includes a cover letter that is coupled with the model notice. The cover letter and model notice is populated with employer and employee specific information. Upon the completion of a Lookback Period ACAManager will display an alert on the dashboard informing you that a Lookback period has concluded and notifications may be submitted. Click Here to view the Notices. Alternatively, the notices may be viewed by navigating to Notification Administration and selecting Send Notifications from the drop down menu. 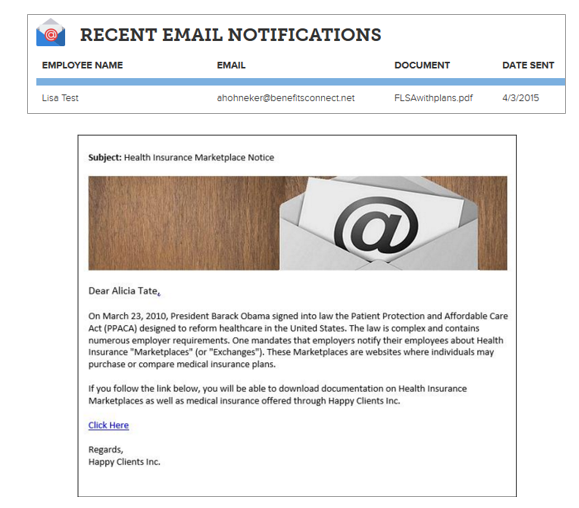 The model exchange notices may be sent to employees by email in mass. From Navigation Bar, click Notification Administration and select Send Notifications from the drop down menu. In order to direct the notices to the employees, click Send Notification to email the notice to an individual employee and click on Send All Notifications to email all of the employees associated with the respective look-back period. To view a list of employees associated with the corresponding look-back period, click View Employees. Submitted forms can be viewed on the Dashboard or under the Employees Profile.